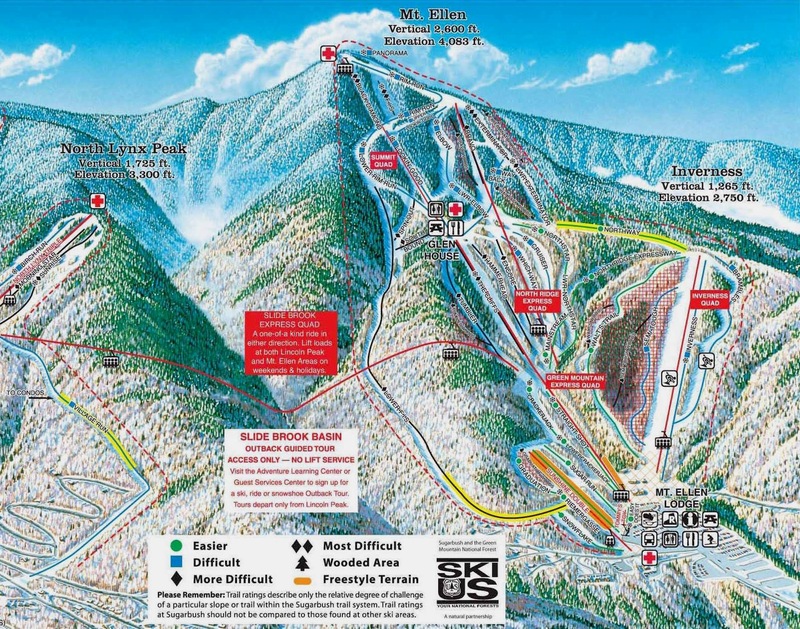 Sugarbush is located in the Mad River Valley, also the home of the Mad River Glen Ski area. The current incarnation of Sugarbush was formed when the Sugarbush Resort acquired neighboring Glen Ellen ski area in 1979. In 1995, an 11,000 foot long chairlift, the Slide Brook Express, was built to connect the two resorts. In October of 2001, Summit Ventures bought the entire resort from American Skiing Company. Summit Ventures is headed by Win Smith, a long-time Sugarbush skier who can be spotted on the slopes and in the lodges on a near-daily basis. With a private ownership group made up of skiers, the mountain has seen steady improvement in facilities since 2001. One major new lift has been installed, many modern snowmaking guns have been added, the Lincoln Peak base lodge was torn down and reconstructed, two major condominium complexes have been built, and two significant skier services buildings (ski school, rentals, children’s programs, ticket offices, etc.) have been added.To skiers who have not been at Sugarbush since the turn of the century, it really is a completely different mountain, at least at the base. But, the real appeal of Sugarbush is on the hill itself. This is a mountain populated by hard-core skiers who love difficult terrain. Only 20% of the resort’s 111 official trails are designated as easy (green) terrain, while nearly twice that many trails are listed as expert terrain. In addition to the numerous expert trails, Sugarbush has officially opened many tree runs that used to be known only to locals. 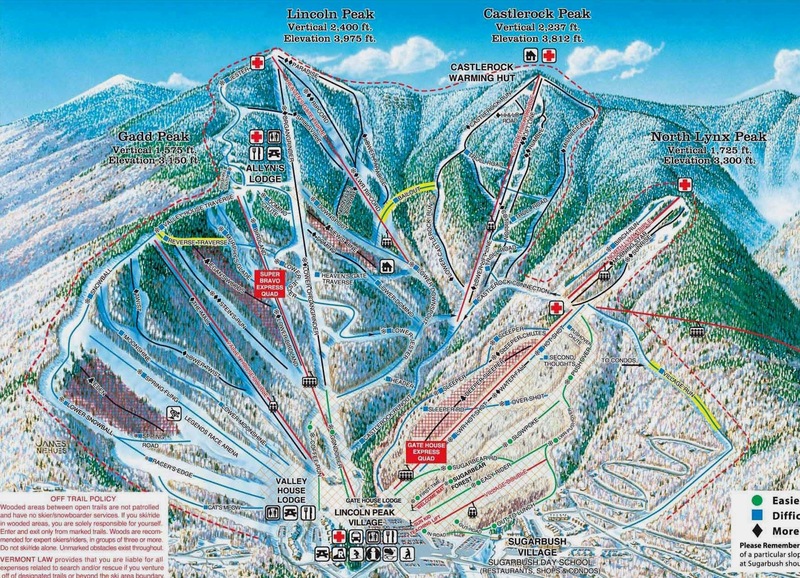 For years, there were only four tree runs on the map at Lincoln Peak. Now, there are many more, and some of them offer some of the most challenging skiing in the east. Plus, many more routes exist, many of them well known, but only to the locals. One of the highlights of Sugarbush is the Castlerock ski area, which is very much like a miniature Mad River Glen tucked into the center of Lincoln Peak. There is no snowmaking, grooming is infrequent, although it happens occasionally, the area is served by a somewhat slow double chair that deliberately limits the number of skiers on the four main trails, multiple side trails, and numerous tree lines in this area. Another popular destination is the Slide Brook Basin, which is accessed from the North Lynx chair. No grooming or snow-making exist here, and the entire bowl is “ski at your own risk”. However, most of the trails are easy to follow and most have moderate grades. The skiing is moderately difficult and very remote. Skiers return to the main mountain via shuttle bus after skiing the Slide Brook Basin. Please be sure the busses are running before entering this terrain and do not ski here alone. Groups of 3 or more are recommended for safety reasons. Mt. Ellen tends to be a bit colder and windier than Lincoln Peak, and it has an older and more rustic base lodge. It is also less crowded and offers excellent terrain. The steepest on-trail pitch at Sugarbush can be found on skier’s right as you enter the FIS trail from the summit quad. Bravo and Black Diamond offer large moguls that will challenge anyone. Tree runs found off of Exterminator, Bravo and Tumbler are fun and challenging. But, many easier trails can be found as well. Walt’s is a perfect example of a remote-feeling and fun trail for the non-experts. Back at Lincoln Peak, check out Stein’s Run or Ripcord for steeps. If you want a more natural and remote experience while still on trails, look to Paradise or Rumble. Using appropriate safety precautions enter the Long Trail from Paradise and seek out numerous steep tree lines. Inbounds, look to the tree runs Gangster’s Grotto or Stein’s Woods for steeps, or Eden, Race Course Woods, or Deeper Sleeper for moderately easy tree lines. Beginners should stick to the Gate House chair at Lincoln Peak and the Inverness or GMX chairs at Mt. Ellen. Intermediate skiers can easily make to the summit of any chair except Castlerock and expect moderate cruising terrain to the bottom. At the end of the day, be sure to stop in at the Castlerock Pub, and let Shawn Fuschetto serve you a beverage from a broad selection of Vermont-made beverages.